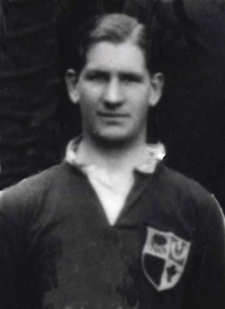 George McIwaine was a South African wing forward who, although he only played 33 games for Gloucester between 1925 and 1927, became a great favourite with the Kingsholm crowd and made a lasting impression. He won Cambridge blues in 1926-27-28, was on the winning side in the varsity match in all three years and played five times for Gloucestershire. He played for Gloucestershire and Somerset against New South Wales in 1927, toured Argentina with the 1927 British Isles side, playing in all four unofficial tests and was a Barbarian. He was considered unlucky not to get an Irish trial. George Arthren McIlwaine was born in South Africa c1905. His father was born in Ireland, giving him an Irish qualification. He was educated at St. Andrew’s College, Grahamstown in the Eastern Cape and Selwyn College, Cambridge. In his first year at Cambridge McIlwaine became a great friend of F J Seabrook, who went on to play 55 games for the Gloucester club. Seabrook introduced McIlwaine to Gloucester where he received coaching from Tom Voyce and developed into a top class wing forward. McIlwaine played 16 games for Gloucester in 1925-26 and quickly gained the attention of the Cambridge selectors. Playing for Gloucester against United Services on 6 February 1926 the Citizen reported “McIlwaine was deputised to take up the role of wing forward in the absence of Voyce and he carried out his mission with great success. The young Cambridge player was never far from the ball and was repeatedly in evidence in the open movements. He scored one of the tries with a characteristic burst, literally forcing his way through the opposition.” He went on to take part in the annual tour of Devon with the club. The Citizen said that “McIlwaine played some brilliant games for the City and was extremely popular with the crowd at Kingsholm”. McIlwaine started the 1926-27 season in great form. The Times commented on his performance for Gloucester v Northampton on 25 September 1926: “The young Cambridge-South African forward was greatly in evidence in this game and the intense heat and hard ground made no difference to him. He brought off several fine bursts and tackled with unerring deadliness.” He gained his first blue on 18 December and The Times said of his performance in an overwhelming Cambridge victory by 33 points to 3: “Mcilwaine the South African I consider to be the finest forward on the field. He was truly remarkable in all he did. Good in the line-out, a genuine scrummager, yet always “up” when the ball went loose.” Again, The Times reported on Gloucester’s 11-0 victory over Swansea on 1 January 1927: “…..on the fringe of the scrum McIlwaine was ubiquitous and apart from the two tries he scored he was of immense service in upsetting the combination of the Swansea backs.” By this time, he had already attracted the attention of the county selectors and had played for Gloucestershire against Yorkshire, the touring New Zealand Maoris and Devon. The Times was prompted to say that “there are more unlikely things than that the young South African who is qualified for Ireland will be capped before the termination of the International tournament. Mcilwaine has studied the wing forward game seriously and he is one of the best exponents of the style of play today.” This was a tribute to the coaching he had received at Gloucester from Tom Voyce, the “father” of wing forward play. George McIlwaine’s outstanding performances for Gloucester and Cambridge University won him a place on the ground-breaking 1927 British Isles summer tour of Argentina, which was managed by former RFU president J M Baxter. The team won all ten games played on the tour and McIlwaine played in all four unofficial tests. At the start of the 1927-28 season the Citizen said that “it is hoped that G McIlwaine will lend assistance in the earlier matches.” He played in victories over Northampton at Kingsholm on 17 September and Bristol five days later before being rested against Moseley at the request of the Cambridge captain. McIlwaine then played his last game for Gloucester on 1 October – an 8-8 draw with Guys Hospital at Honor Oak Park. Unavailable for the county due to Cambridge calls, he gained his second blue in December and after the varsity match played for Gloucestershire and Somerset against New South Wales at Bristol on December 31. In 1928-29, his final season at Cambridge, McIlwaine confined his rugby to the University XV until after the varsity match. He suffered frequent criticism of his lack of pace and form compared with previous seasons but gained his third blue and prompted The Times to comment that he “deserves full credit for playing his best game of the season” in a third successive Cambridge victory. As he was planning to be in Cheltenham during the Christmas vacation, the Citizen still entertained hopes that he would get a further game for Gloucester, but he was selected for the Barbarians to play in the annual game at Leicester on 27 December. The Times, reporting on the match said “McIlwaine, it is pleasant to see, has regained much of his old form.” After Christmas he joined Richmond RFC for the remainder of the season and on 13 February 1929 played his last county game for Gloucestershire against Devon in the play-off for the South West title at Torquay, appearing on the team sheet as representing “Richmond & Gloucester”.